← Bolivian middle class had enough with the coca caudillo! Bolivian Thoughts opinion: Bolivian democratic liberties are certainly in jeopardy! The demagogue government of the cocalero intends to remain in power and “needs” to control information … to continue misleading those who still believe this delusional dictatorial caudillo should remain in power … enough!! 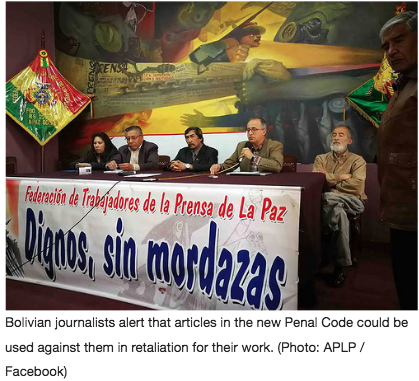 The National Association of Bolivian Journalists (ANPB, for its initials in Spanish) and the Association of Journalists of La Paz (APLP) have declared an “emergency” in rejection of articles of the country’s new Penal Code the entities say could be used against professionals in retaliation for their work. “Freedom of expression is supported by the Political Constitution of the State, in Article 107, and recognizes the Press Law as the norm that regulates the work of journalists through self-regulation through its courts of honor and the National Court of Journalistic Ethics,” ANPB and APLP said. The president of the Chamber of Deputies, Gabriela Montaño said that articles 309, 310 and 311 were already contained in the previous Penal Code and that the punishment of anyone found guilty of injuria, calumnia or defamation consisted of apologizing to those offended, according to La Razón. The new Code, Montaño said, aggravates the penalty for these crimes if they are committed through a media outlet, demanding the payment of a fine to the person the judge considers was impaired by the statements. However, if a person is found to be a repeat offender of the offenses of injuría, calumnia or defamation against the same victim, Article 44 of the new Penal Code provides for imprisonment between one month and one year in the case of a culpable crime, and between six months and three years in the case of intentional crime. The new Penal Code, promulgated by Bolivian Vice President Álvaro García [sic] Pinera in December, has faced opposition from various civil groups and professional sectors. Media associations and journalists already protested in September that Article 200, which sanctions professional misconduct, could mean the criminalization of journalists. After a few weeks of mobilization, Bolivian congress members finally excluded communications professionals from Article 200 and added Article 195, which penalizes crimes against freedom of expression and the press. This entry was posted in Bolivia, Politics, Social Unrest and tagged demagogue, democracy in peril, government failures, public policy failures, totalitarian regime. Bookmark the permalink.